Landis' Labyrinth, Inc: Our guide to travel-friendly toys! Our guide to travel-friendly toys! We know this is the post you're really been waiting for! And why not? It's summer, and for many of us it means that it's the time to take a break from work and enjoy spending time with our families. And for those of you lucky enough to get out of town for a bit, we know it means figuring out how to entertain the kids on those pesky car and airplane rides. We can't promise that they won't ask, "Are we there yet? ", but we can offer some suggestions to make their trip, and therefore yours, a more pleasant and enjoyable experience. First up are the toughest of groups to entertain: babies and young toddlers. They should be simple, right? Everything entertains them, right? Well, not so much in a confined space where you have a limited amount of options with which to entertain them. You could hope for them to sleep, but in case that for some reason doesn't work out, here are some of our ideas. -Books: This one is obvious. It's small, easy to pack, nothing to roll away, and it's both fun AND educational. We just received a great shipment in of our ever-popular Green Start Books, which are made of recycled cardboard and printed using soy-based inks. Good for the environment+ good for you= happy baby! -Puppets: I can personally attest to the power of the puppet to entertain a small child on an airplane. After sitting in front of one who spent hours entranced by her mommy's puppeteering skills, I'm convinced it's one of the best ideas out there for keeping kids calm and focused on a flight. Also, easy to pack, and cuddly in most instances. -Flash/Learning Cards: Again, another obvious choice. We love these ones from Alex that have different textures and designs to help facilitate learning and increase the amount of skills learned from them. -Stickers: We like the re-useable ones from Melissa & Doug because you won't have to spend half the flight scraping them off of the seats, but for the older toddlers who are restrained in their decorating, regular sticker books and packs are great for keeping them happy and busy. 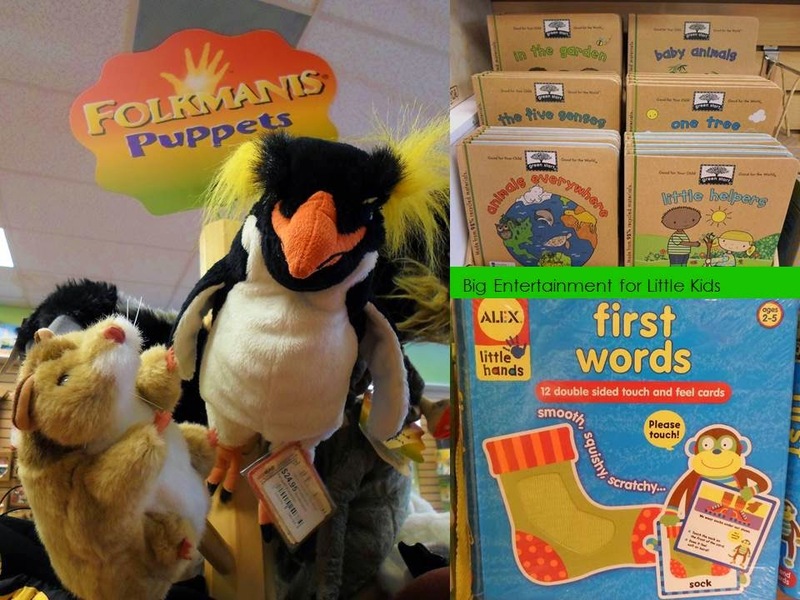 Segueing into older toddlers and up, we have tons of travel books to keep them occupied. These are great for children of multiple ages as they are flat and lightweight (so ideal for carry-ons), and they really can last for hours. -Scratch 'n Sketch Books: Nearly mess-free, all you need is the book, the wooden stylus it comes with, and your imagination! Copy the image you see on the right of the blank page, or create your own if you wish. Also available in a trace-along format for beginning sketchers! -Activity Books: Magnetic scenes, magic pens, all the good stuff that we remember on trips as kids. 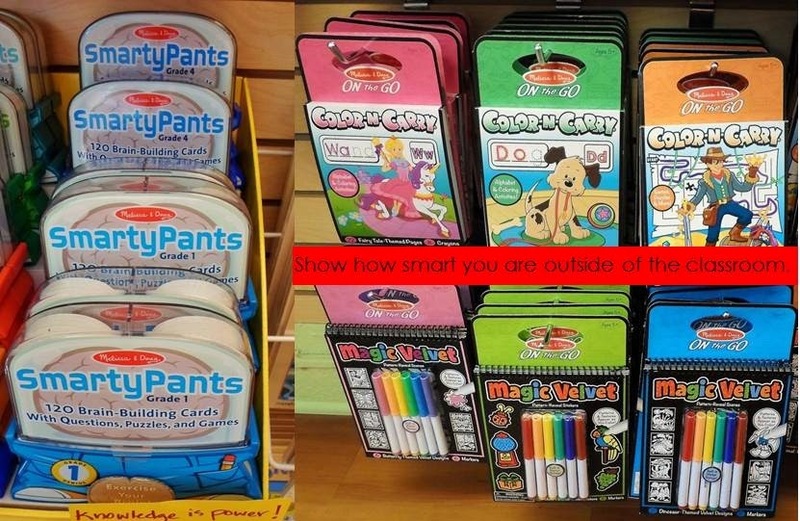 We have branded ones (like The Avengers, Disney Princesses), and non-branded so there's something for everyone here. -Sticker Books/ Coloring Books: We have tons of new stickers and coloring books in from Dover Publications and Mrs. Grossman's Stickers. Notebooks: Sometimes a simple notebook is all you need! Fill in the pages with your own musings, diary-style or as a story. This is a great way to encourage your kids to document their trip and really put their minds to use. It's important to keep your mind stimulated while passing the time. Melissa & Doug understand this, and have come out with some travel-friendly challenges this year. 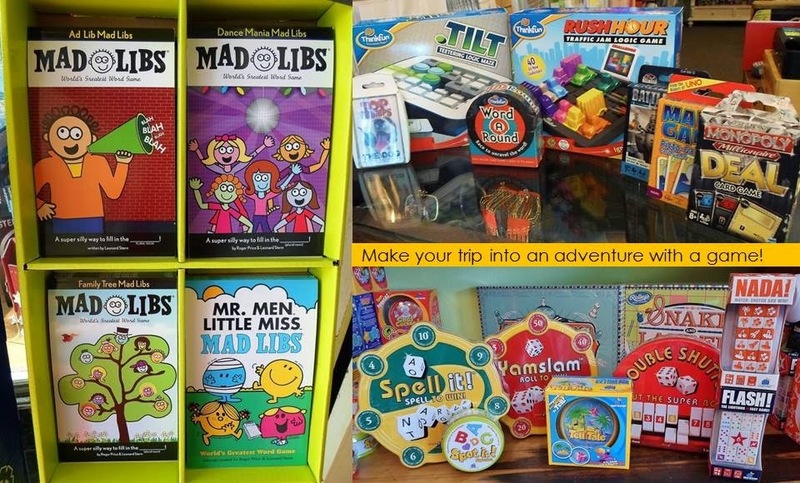 -SmartyPants: Sectioned by grade level, these brainy boxes are filled with questions designed to inform and challenge kids on all sorts of trivia. We tested one of them out, and believe that the ages they are intended for are pretty spot on, and we're not ashamed to admit there were a few questions that even we weren't 100% sure of the answer. It's fun for parents as well as kids, so everyone can get involved! 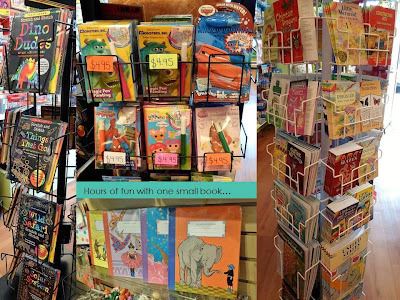 On-the-Go: This is a series of various activity books for the 4-6 year old set. They include both art and thinking puzzles, so for your younger travelers, this is a winner. They come with everything you need to have fun and keep your minds and hands occupied. -Mad Libs: Finally back in stock; always hilarious. We here at Landis' Labyrinth still laugh 'til we cry when we play with them, and frankly, they just get better with age (the more words you know, the better)! They're also great for reinforcing useful lessons in adjectives, adverbs, and nouns. Card and Board Games: Now this really is fun for the whole family! We have a great selection of card games based on classic board games, like Mad Gab, Battleship, and Monopoly (I'm personally a huge fan of the Monopoly and Battleship ones), plus Top Trumps which is a variation of the classic card game War. ThinkFun & Blue Orange also come through for us with some awesome non-card games. We just got a restock of some of our favorite single player games like Rush Hour, Chocolate Fix, and Tilt from ThinkFun, which are great because they'll all puzzles that you have to solve and the challenges start out being quite simple, and then proceed to get extremely difficult. They also have a few new card games like WordARound and Visual Brainstorms that we'll be doing a separate blog post about in the near future. Blue Orange is always a great travel game company because their games are designed to be full games that just so happen to work well when traveling. Yamslam, Double Shutter, and Spell It! are all self-contained dice games so you don't have to worry about your dice flying all over the place, and Spot It! and Tell Tale are great card games with various play methods to keep you entertained for a while. Okay, these aren't toys, but they are fun for some of us! 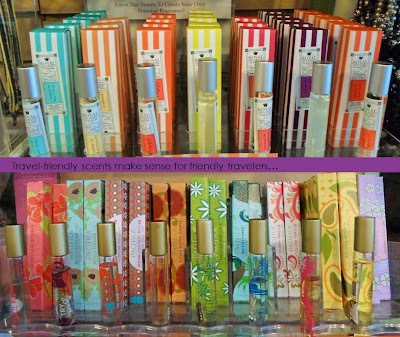 Travel-friendly perfumes are a must-have on any trip, and we have a wide array of options to choose from. Royal Apothic and Pacifica are both fantastic scent companies that people of all ages have loved (I have the Pacifica Blood Orange one myself), and after a day of fun activities running about, freshening up will make both you and your fellow travelers quite happy! And last but not least, the only downside to traveling is leaving your friends behind. So bring an inanimate one along with you to keep you company! Never underestimate the power of an understanding plush toy to calm a nervous or scared child. This way, they can have a good time, you can have a good time, and your fellow passengers will also have a good time. Now that's what you want in a vacation! So have fun, pack well, and as another tip, pack a few small 'surprises' in your luggage to give to your children every half-hour or hour while traveling to your destination. It gives them something to look forward to, and it's a nice way of marking the time 'til you reach your destination.